ComplianceOnline Medical Device Summit 2017 will bring together current and former FDA office bearers, FBI officials, regulators, industry veterans and policy influencers as well as several distinguished CEOs, board directors and government officials. 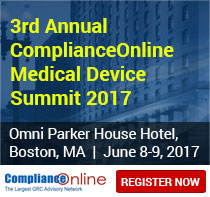 ComplianceOnline, the leading governance, risk and compliance advisory network with over 1500 experts in various regulatory subjects has announced its 3rd Annual Medical Device Summit 2017 venue and speaker lineup. The Summit will take place on June 8 and 9, 2017 at the Omni Parker House Hotel, in Boston, MA. The Omni Parker House Hotel, which is located at 60 School Street, Boston, MA will be a comfortable yet invigorating backdrop for an exciting mix of discussions, talks and breakout sessions. Boston is a city rich with history from the Boston cream pie to the Boston tea party to the midnight ride of Paul Revere. And Omni Parker House puts you close to the city's best-loved locales. The two day event will feature 4 Keynotes, 13 impactful track sessions, 4 stimulating panel discussions and over 300 minutes of networking. This annual summit brings together current and former FDA office bearers, FBI officials, industry and regulatory specialists from around the world to address key issues in compliance, quality and innovation. Stephen Allan Weitzman, Editor in Chief at FDA Information Repository – IRAI, will be joining as one of the key speakers at this year’s summit. Stephen will kick off the day one with a keynote entitled: Adequate Directions for Use" in the Age of AI and Watson. Casper E Uldriks, Former Associate Center Director at FDA's CDRH, Rita Hoffman, RAC, Managing Former Branch Chief, Recalls, CDRH at FDA, David Nettelton, Industry Leader, Author, and Teacher for 21 CFR Part 11, and Steven Grossman, Public Policy & FDA Regulatory Consultant will share Industry trends, and best practices for off-label promotion, post-market compliance, FDA compliance for SaaS/Cloud Environments and medical devices under Trump Administration. Register for early bird tickets to one of the largest gatherings of medical device industry experts this year. Peter Pitts, Chief Regulatory Officer at Adherent Health, LLC. Fletcher Wilson, CEO at InterVene, Inc.
Keith Morel, Ph.D., VP, Regulatory Compliance at Qserve Group US Inc. In addition to illuminating keynotes, the event will feature panel discussions, focused workshops, and exhibitor’s stalls. “This event was very focused on FDA regulatory training, standards and guidance. This was the main reason that I attended and the event delivered all with high quality”, says Research and Development Program Manager IV, Abbott-a Summit past attendee. “The summit was a great success in my opinion, very knowledgeable speakers and interesting topics. I extended my network of contacts that would be beneficial for our company. Thank you for giving this great opportunity and hoping to attend another one next year”, Quality Assurance Manager, BCSI SAFE Sens, added another attendee. The Device Summit 2017 has been made possible with the support of its event partners, including MetricStream - Platinum Sponsor, Journal of Medical Device Regulation, Technology Networks, Pharma Voice, Industry ARC and MM&M – Media Partners and Toxikon as Event Exhibitor.